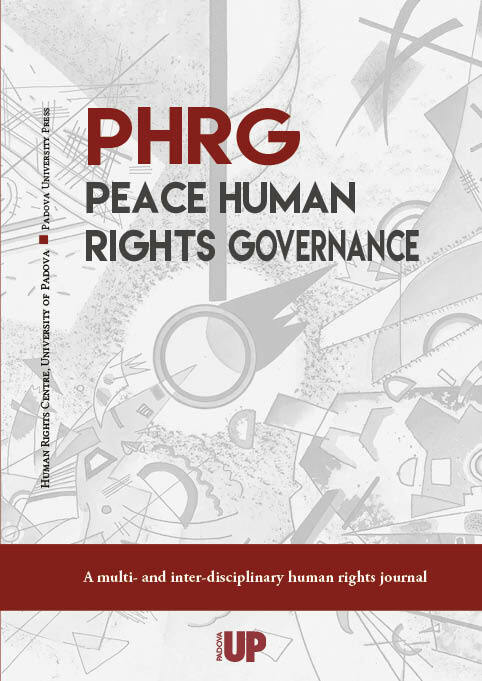 Peace Human Rights Governance (PHRG) is the peer-reviewed academic journal of the University of Padova Human Rights Centre 'Antonio Papisca', published three times a year, in March, July and November. PHRG is the new series of Pace Diritti Umani – Peace Human Rights (2003-2013, Marsilio Publishing, Venice). PHRG constitutes a new scientific resource within the increasing and multi-faceted global human rights studies community that aims to present original, theoretical, methodological and empirical contributions to current human rights and international relations issues while actively favouring the development of a solid multi- and inter-disciplinary and multi-level approach to peace and human rights research and dissemination. The main topics of PHRG include, but are not limited to, the relation of human rights and subsidiarity with world order and governance issues, international law, international politics and organisation, international and cosmopolitan democracy, national and European foreign policy, civil society transnational networking, religions and human rights, city diplomacy, local policies and services, global citizenship, public policy, intercultural dialogue, women’s human rights, the human right to peace, conflict transformation/conflict resolution, education processes, and trafficking of human beings. On the occasion of the 30th anniversary of the adoption of the Convention on the Rights of the Child (1989-2019), Peace Human Rights Governance (PHRG) - the multi-disciplinary journal of the University of Padova Human Rights Centre “Antonio Papisca” – is devoting a special issue of the Journal to “Challenges and opportunities for children’s rights facing developments in technology”. Manuscripts, formatted following strictly the journal guidelines, should be sent to phrg.journal@unipd.it by Monday 10th June 2019. The deadline for submitting original research papers to be considered for issue 2 of 2019 (vol 3) of PHRG is 29th April.